The world of fine wine descends on Bordeaux next week for the so called ‘en primeur’ tastings of this über-ripe, much-hyped vintage. Thousands of professionals, and many more hangers on, will be trying to evaluate the wines and stay looking sharp, despite having black teeth. We’ve got a small team staying with us, and we’re starting in Pomerol on Monday 29th March, St-Emilion on Tuesday 30th, Pauillac, St-Julien, St-Estèphe and Margaux on Wednesday 1st April, Péssac-Léognan on Thursday 2nd, and then I’m going back solo to the Médoc to the First Growths and ‘Super-Seconds’ the week after Easter. Judging by the harvest last September and October, my guess is that the most exciting spots will be Pomerol, Pauillac, St-Julien and St-Estèphe, although it should be impressive all round. The point(ed) black teeth are descending: record-breaking 6,000 journalists. 70% French, then UK, Belgium. Surge of first-timers from US and China. Should be fun. Will look for you for a quote! p.s. 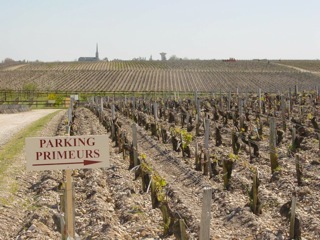 did Pomerol have hail, too?